- Surface Pressure & Precip. - Snow Depth & Snow Accum. Sunsets often have a red or orange color to them. Why is this? Sunlight (what we call "white light") is made up of all different colors of light, each having a different wavelength. During a sunset, more red light is scattered toward you because of aerosols in the lower atmosphere, compared to the amount of blue or green light that is scattered. So why isn't the sky red when the sun is overhead? 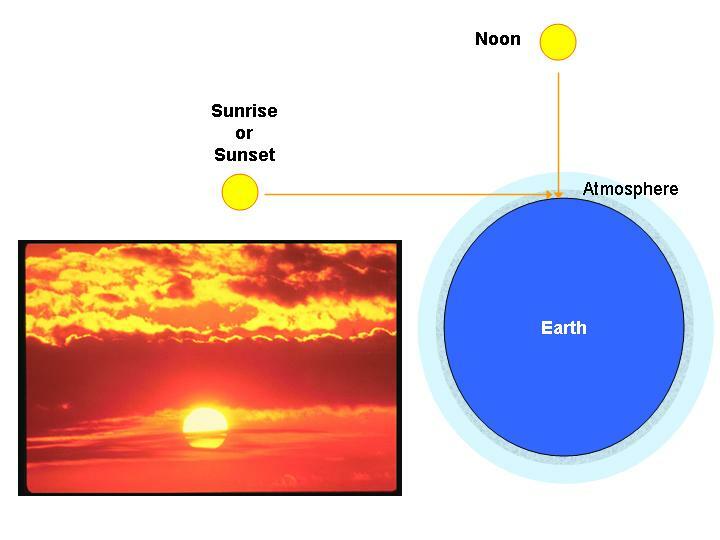 Because at sunset (or sunrise) sunlight is passing through a much longer path of the lower atmosphere, which is where most of the aerosols are concentrated. So, the scattering effect of the aerosols is magnified, causing more red light to be scattered than other colors of light.